The Twelve Apostles or The Twelve Disciples were the twelve followers of Jesus while He walked the earth. Jesus called each of them to Him at the start of His earthly ministry and they followed Him during the three years of his teaching. While making many gaffes and having difficulty understanding all that Jesus was, after His crucifixion and Resurrection and the imparting of the Holy Spirit, they became men of great valor and the forefathers of Christianity. They are Saints in the Catholic and Orthodox traditions except for Judas Iscariot, the traitor of Jesus. 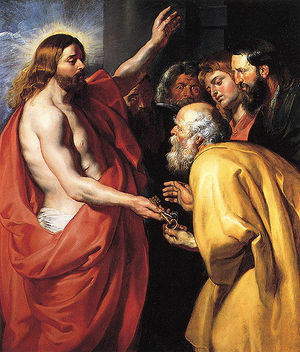 Rubens, Christ surrendering the keys to St Peter. Thomas next and Matthew, too. Simon the zealot and Judas the traitor. The Twelve Apostles Daily Bible Study. ↑ See Why Did He Do It? This page was last modified on 14 September 2016, at 18:57. This page has been accessed 40,834 times.